Need someone to send out your newsletter or press kit whenever you have one? We format campaigns, design newsletter templates, custom sign-up forms and landing pages. We also can send out your newsletter and/or press kit. Design will include Newsletter Header Design, set up of your auto responder, form set up and landing page. Note: For content and images either you will provide or we can provide it for you. This will be discussed and information provided in the price quote. 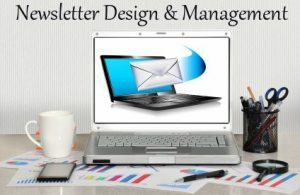 Newsletter Management Service: Need someone to send out your newsletter or press kit whenever you have one. We offer that service. Basic Plan base price: $20 per newsletter. This is to send out based on what you send (content and images). Timing is 5 days or more prior to date want the newsletter sent out. If you have information earlier you can send it before the 5 days. If you send newsletter less than 5 days to when you want sent out there is a rush fee of $5. Premium Plan base price: $30 per newsletter. This is to send out based on what you send (content). We’ll make graphics based on content in newsletter up to a 5 graphics (you can request one time change of graphics used). Timing is 5 days or more prior to date want the newsletter sent out. If you have information earlier you can send it before the 5 days. If you send newsletter less than 5 days to when you want sent out there is a rush fee of $5. Ultimate Plan base price: $50 per newsletter. We will create content for you. Tell us what you need and we will write it. We’ll make graphics based on content in newsletter up to a 5 graphics (you can request one time change of graphics used). Timing is 10 days or more prior to date want the newsletter sent out. If you have information earlier you can send it before the 10 days. If you send newsletter less than 10 days to when you want sent out there is a rush fee of $25. We offer quarterly, semi-annual and yearly packages. Want to know more contact us to discuss.